From the heart of Africa’s equatorial rainforest, the Metropolitan Museum presents a special exhibition of acclaimed sculpture on view now through March 2, 2008. This exhibition explores the significance of the works presented in their countries of origin, and how their reception in the West led them to enter the mainstream of universal art. Organized thematically, “ External Ancestors: The Art of Central African Reliquary” explains cultural and spiritual inspirations that led to their creation in equatorial Africa. Drawn from the most important collections of African art in Europe and the United States, the more than 130 works featured in the exhibition relate to 12 distinct traditions in Cameroon, Equatorial Guinea, Gabon, the Republic of Congo and the Democratic Republic of the Congo. They were created to celebrate the lives of an extended family’s most notable ancestor.In the collection, there are many works that were sources of inspiration for early 20th century Western avant-garde artists who collected them and kept them in their studios. The exhibition opens with a series of comparisons between celebrated sculptures, such as 19th century Fang reliquaries that were created in Gabon with works from the Metropolitan’s superb medieval and Asian art collections. Among the highlights of the exhibition are the wood heads, half-figures, and full figures carved by Fang masters. 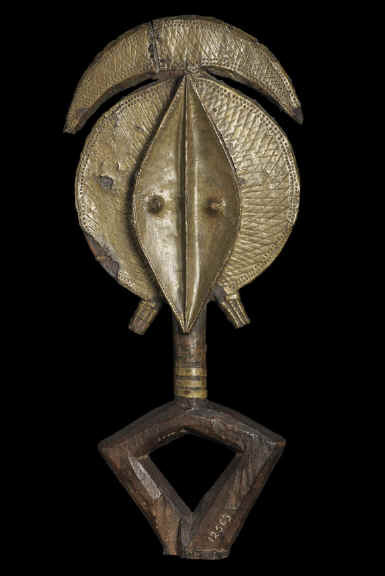 Also featured are two-dimensional wood figurative elements are sheathed in precious metals that were created by Kora and Mahongwe peoples in Gabon and the Republic of the Congo.Among the seminal examples on view is a Sculptural Element from a Reliquary Ensemble (from the Musée du Quai Branly) created by a Kota artist. Made of wood, brass and copper, this historically important piece was collected over the course of an exploratory journey to the region by the French 1883 expedition that was led by Pierre Savorgnan de Brazza. Another distinctive genre consists of Bwende and Bembe soft sculptures from the Republic of Congo. Among the most spectacular and rare examples is a life-size female figure by the Bwende master Mucosa of Kingoyi that was collected by the Swedish missionary Efrain Anderson in 1938 (from the Museum of World Culture). Made possible in part by the William Randolph Hearst Foundation, the exhibit is accompanied by a film that emphasizes the importance of performance rites as devotional forms of expression and a catalogue, “External Ancestors: The Art of the Central African Reliquary,” published by The Metropolitan Museum of Art and distributed by Yale Press.